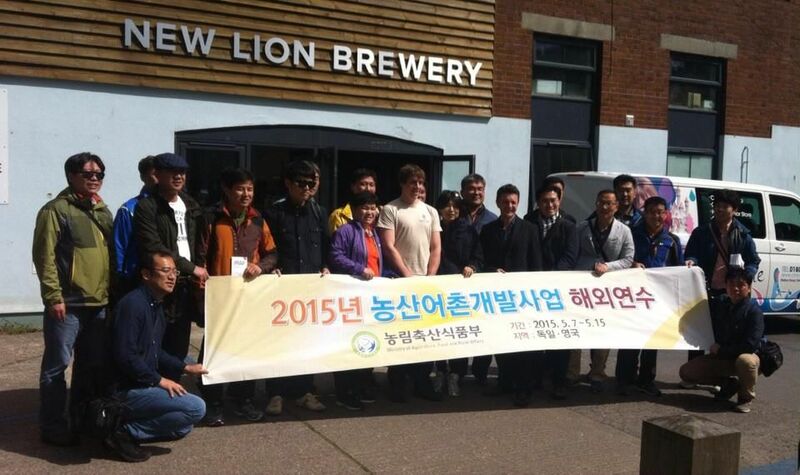 Earlier this week, New Lion Brewery had a visit from 22 representatives from the Korean Ministry of Agriculture and Rural Affairs. It appears that Totnes truly has an international reputation when it comes to issues of localism and local economics, and it’s our efforts in that area that were of interest. Mat Henney, our Head Brewer, reports that “judging from the queue to the toilet on their arrival, lunch had been well lubricated with a few pints at the Bay Horse. We had a chat about the Grown in Totnes oats project (please support their crowdfunding appeal!) and GroCycle who launched theirs earlier this year. We have brewed a beer in collaboration with both of these companies. We also talked about local malt (which we use) and hops (which are very hard to come by). There was just time for this group photo before they carried on to ATMOS.